I tested multiple websites, some created by strangers, others created by me, some hosted on my server, others hosted on servers of major hosting services. On all of these websites the problem occurs. For every website multiple Live Tests were performed. 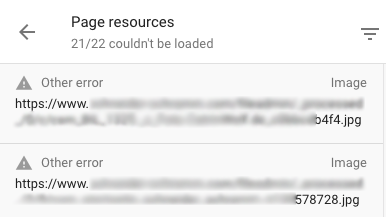 Sometimes all resources were loaded perfectly, but most of the time (>90%) nearly all of the resources (including resources hosted by Google, e.g. Analytics or Google Fonts) did not get loaded. The Search Console simply marks it as "Other Error"
When using the old Search Console, the websites get marked as "mobile friendly" and are rendered normally. PageSpeed Insights and the new Google Mobile Friendly Test also render the pages perfectly fine. The resources are not blocked by the Robots.txt. I also tried explicitly allowing the Googlebot to access CSS, JS and images. It did not help. I've read speculations, that the new Search Console simulates a very slow mobile connection, but I've created very lightweight dummy-websites whose resources are not getting loaded as well. Is anyone experiencing similar problems with the new version of Google Search Console? Browse other questions tagged seo google-search-console googlebot or ask your own question.